On the 14th of October, comrade Cirro Rizzato was executed by members of the anti-criminality section of the police. He was part of a group of revolutionaries who had devoted themselves to carrying out expropriations in the Paris region recently. Money is indispensable in the revolutionary war. Cirro knew this, everyone should know this. Taking it where it can be found is dangerous and usually laborious, however it is a duty, a revolutionary duty. In the shootout, three of his comrades were able to escape, two of the police were wounded. He died for what he fought for: communism. Cirro has been murdered. The bourgeois press has spewed its vomit, the disassociated Italians have dissociated themselves, the preachers have stepped into their pulpit, the cowards have been frightened, the “internationalists” of the salon and the ghetto have discretely closed their eyes. Everything is going fine in the world of scum. Cirro was born in the ghetto-neighborhood “Quarto Oggiaro” in the Milan suburbs. From the age of 13 to 14 on, he joined the antagonistic forces and participated in the actions of the revolutionary collective of his neighborhood: housing occupations, demonstrations, the expropriation of shops..he was part of “Worker’s Autonomy” during its mass development, subsequently he is in opposition to the leadership of that movement which advocates a diversion of the offensive. He quits that organization with his collective in order to join Front Line in 1978. Working in a carpentry shop, he is a militant in a “Squadra”, semi-legal units which along with the “Ronde” form of the basis of Front Line’s communist project. In Spring 1980, Front Line is very hard hit by repression, more then 1500 persons are arrested and most of the organization is dissolved by its “historic” leadership. The “Squadra” and the “Ronde” find themselves deprived of an organizational point of reference, but they continue to operate and participate in the debate which traverses the entire revolutionary movement. At the end of 1980, the “Squadra” of Cirro joins the COLP (Communist Organization for the Liberation of the Proletariat). 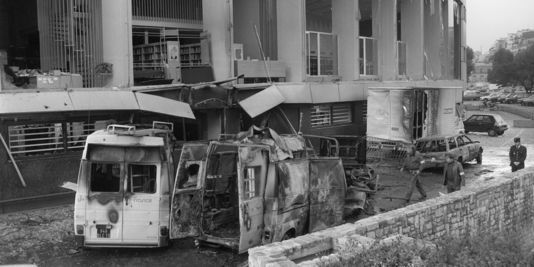 We still recall in our memory, the successful attack claimed by that collective on the special section of Rovigo Prison (January 1981). In November 1982, he escapes a police raid which destroys the collective to which he belongs; from then on he and his companion live in the underground. Cirro had nothing to do with a Scalzone, a Pace, a Negri, or the other gentlemen of the “political”, he was a proletarian who took up his political responsibilities in the debate for a resumption of the offensive: “…It is determinate in this phase of work towards the definition of the program of communist transition that it is currently a question of a revolutionary transformation with the intention of resuming the offensive.” He worked for the reconstruction of a genuine organizational pole capable of going beyond the present situation, certain of one thing; it is not a beginning or an end, but a long walk to communism. The revolutionary movement in Italy is justifiably suspicious of the Italians resident in Paris and their political activities. The Milan communique of October 16th is very clear on that point. Cirro was here on a mission not to chatter in the “associative” meetings.